“I was in poverty, but I overcame it through my own will and with the help of the project,” Komola Roy says proudly. 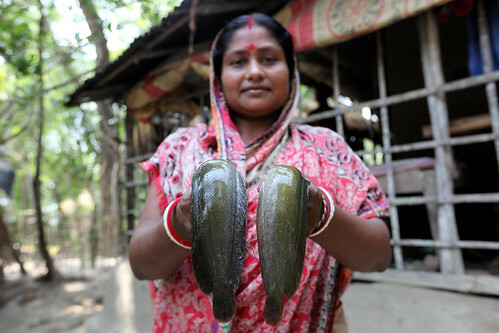 A mother and housewife, Komola is one of 96 women across eight communities in southern Bangladesh who helped design and implement a research project to identify the best varieties of fish and feed for local fish farming conditions. 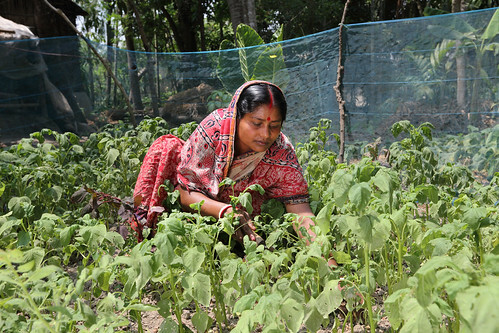 In a region where more than half the population struggles with extreme poverty and food insecurity, the Participatory Research on Habitat Restoration for Small Ponds in Bangladesh project is helping women produce their own food and increase their income through transforming their unused ponds in to fish farms. “Before the project, we had financial problems. 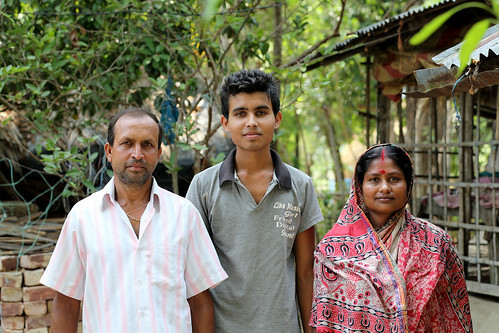 There were many days when we had one meal in the morning and then had to skip the next one because we didn't have enough food at home,” says Komola from the leafy village of Fultola in Khulna district. Many rural poor, particularly women, lack the skills and knowledge to farm fish, especially when faced with challenging growing conditions like shaded and seasonal ponds found in Komola’s village. Fruit and timber trees are often grown around the banks of the ponds, which cast large shadows over the water, restricting the growth of natural food in the pond and making it difficult for fish to grow. 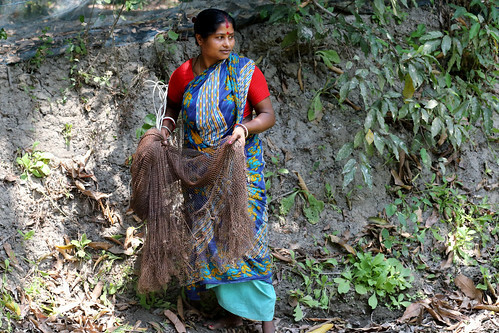 Restricted by social and religious norms, Bangladeshi women are often unable to access opportunities like training programs, which can help them overcome these challenges and improve the productivity of their farms. Following workshops on gender issues and fish farming, and with support from the project researchers, groups of up to 12 women in each community contributed to the design of the research plan. They led meetings and conducted research in their own ponds, recording results and reporting back to the group with their findings. “I found tilapia production was the best because there is deep mud in my pond. Tilapia grows better in mud and shady areas,” explains Komola. As their ponds are close to the home, the women can comfortably take on roles like fish feeding, monitoring growth rates and harvesting. “When I started working in my garden and pond, other people came to see and were inspired,” Komola says. In her first year of fish farming, Komola and her husband harvested BDT18,000 ($USD230) worth of fish from their pond, most of which they ate at home. They sold the excess produce at the market for a profit of BDT3,600 ($USD46.50), which has helped to pay for their son’s school fees. “Now, we don't need to buy fish. In the past we could buy them maybe only once a week… Now we can have fresh fish everyday for our meals,” she adds. Participating in the project has also changed the way Komola and her husband interact at home. “Before the project we had financial problems, so there was always tension between us in the household. But now everything has changed,” she says. “In our community, all the wives offer the best portion of the meal to their husbands. Now, after the project, my husband happily requests me to have the fish head by myself,” Komola adds with a smile. In a country where more than 20 million people suffer from malnutrition and nearly one third of the population are living in poverty, these improvements at the family and community level are significant steps towards wider change. 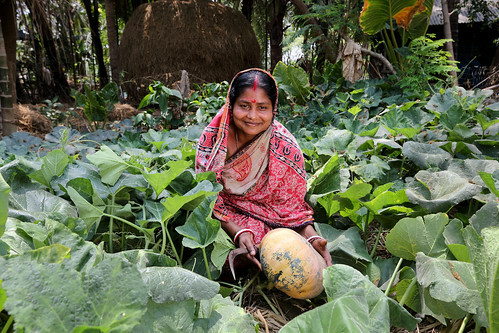 The project will continue to support women farmers in Bangladesh and improve the productivity of their farms over the next two years. Number of times per week households consume fish. Up from 1-2 times at start of project.